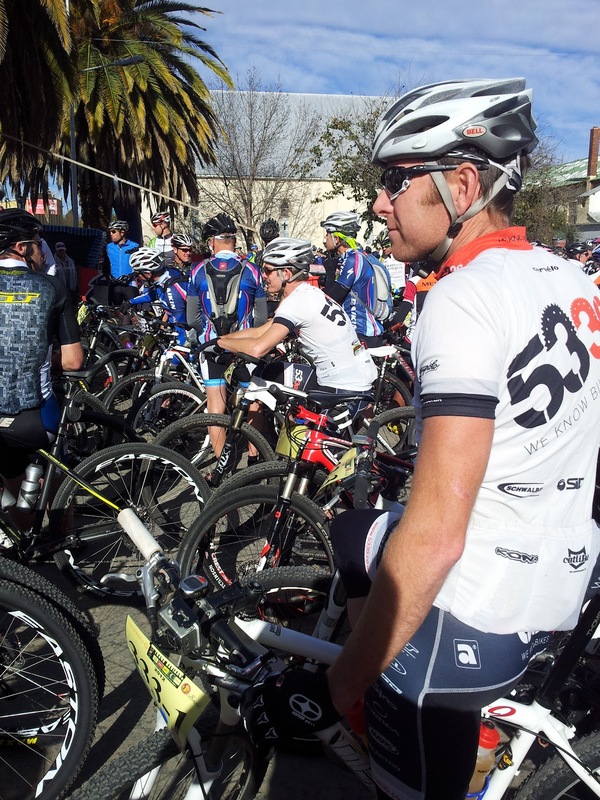 At 10 o'clock on a cold, windy morning in the sleepy hollow of Willowmore, one of the highlights on the South African mountain biking calendar gets underway - the Trans Baviaans. For The Night Time Ninjas, the race begins several months before, and I'm not talking about competing with other teams, I'm talking about the intra-team competition. The objective is to give the impression that you are the weakest link in the three man team, while doing everything in your power to ensure that you aren't. The only rule is "There are no rules". Anything goes - secret training, strategic alliances, double crossing, faked illnesses, false rumours, doctored Strava uploads. It's a mental game that has you secretly spying on teammates' training progress, inflating body fat percentages, and doing some extra training on the rollers in the garage where no one can see. Come the race weekend all that changes - the gloves come off, the secrets are spilled and you talk up your game to convince your teammates that you are in peak form, finely tuned and ready to race. In a three man team you don't have to be the fastest, but you certainly don't want to be the slowest. Part of my pre-race psychological warfare arsenal is to book our accommodation in the Willowmore Primary School hostel. Apart from being convenient and central, it has several characteristics that tend to get to Old Man John. There is seldom hot water, and for a shower addict this is apparently quite a problem. The mattresses are thin, the pasta meal is oily and stodgy, the wooden floors are noisy, the rooms are cold, the toilets clog frequently, and there is always at least one team that has to wake up at 5 in the morning and walk around making a noise like a herd of Nguni cattle. 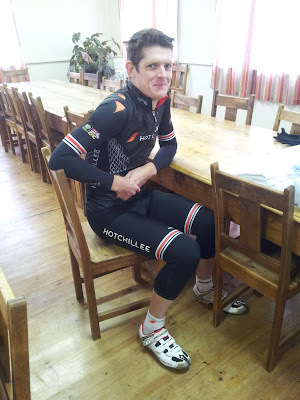 Captain Craig added to the warfare by suggesting that we ride in the now infamous HotChillee Epic kit. While both he and I like the tight fit, OMJ has a serious aversion to anything that a rugby prop forward can't fit into. 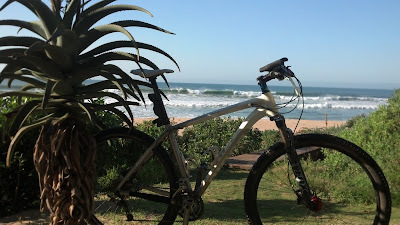 Even having a new bike didn't prevent additional attacks on OMJ - it might be new, it might be light, and it might be a 29er (finally), but it was a Silverback. Amazingly, OMJ took this all in his stride. Perhaps he had made peace with his place in the team, or perhaps he had a bigger plan. 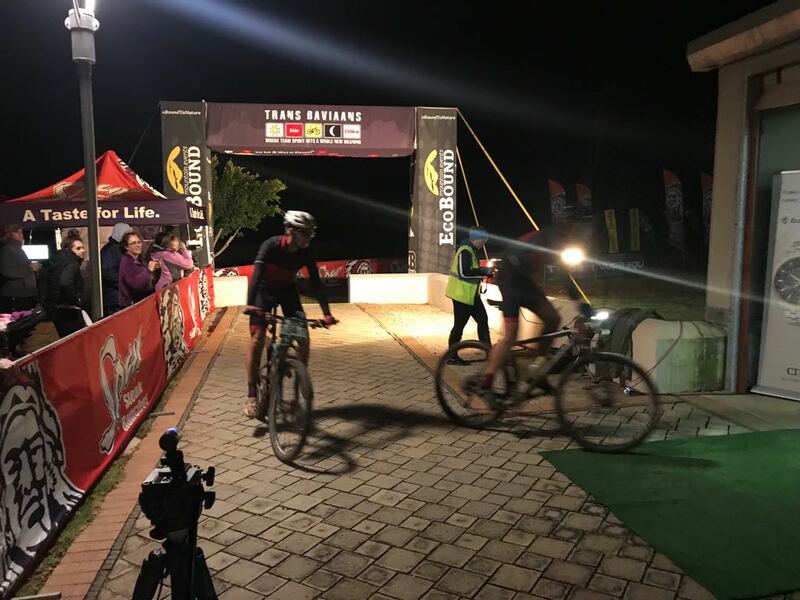 The Night Time Ninjas rolled into the start chute with 10 minutes to spare, quietly confident that we'd have a good ride, and secretly hoping to improve on last year's 6th place. For a long 10 minutes we sat in the cold wind and watched the rain approach as we listened to a local rendition of the National Anthem before we were unleashed for the 10th edition of the Trans Baviaans. 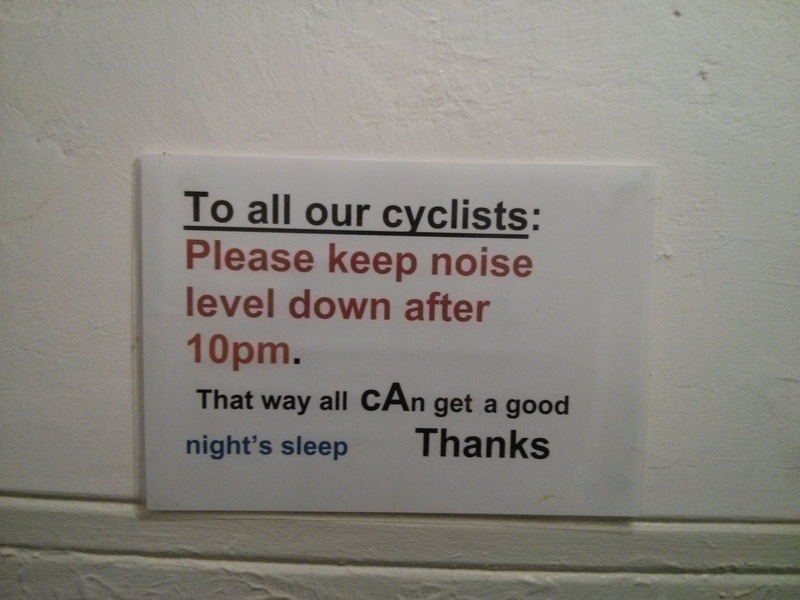 As usual, the first hour is like a road race - it's hard and fast, with the bunch doing its best to whittle out the free loaders and wheel suckers. Forget about saving heart beats and keeping the legs fresh, if you want to reap the benefits of riding in the lead bunch later on you've got to do whatever it takes to make sure you don't get dropped, while keeping an eye on your teammates to make sure they are showing the same commitment. 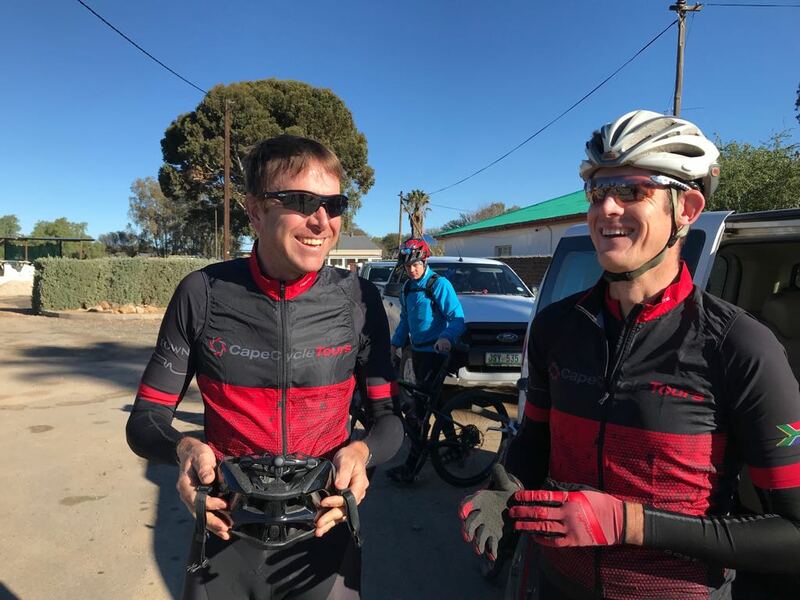 With 80kms done, things were looking good - there was a select bunch moving along at a decent pace with a very welcome tailwind making life rather easy. Checkpoint 2 was approaching, and shortly thereafter the hills would begin. The sense of calm that hung over the bunch was shattered when Captain Craig called me over and mumbled about something being broken. A quick scan of the scene didn't reveal much - he was in one piece, and from what I could see, so was his bike (to be fair, his bike is always in a state of brokenness, but nothing seemed exceptionally bad). It was when he hit a slight bump in the road and his rear wheel bounced a foot to the left that I realised what he had said - his frame was broken. The irony was that I'd broken the same make of frame a year previously in exactly the same place, except mine had been a slight crack, compared to the clean break that was staring up at Captain Craig. Briefly, for 5 seconds, my heart sank. 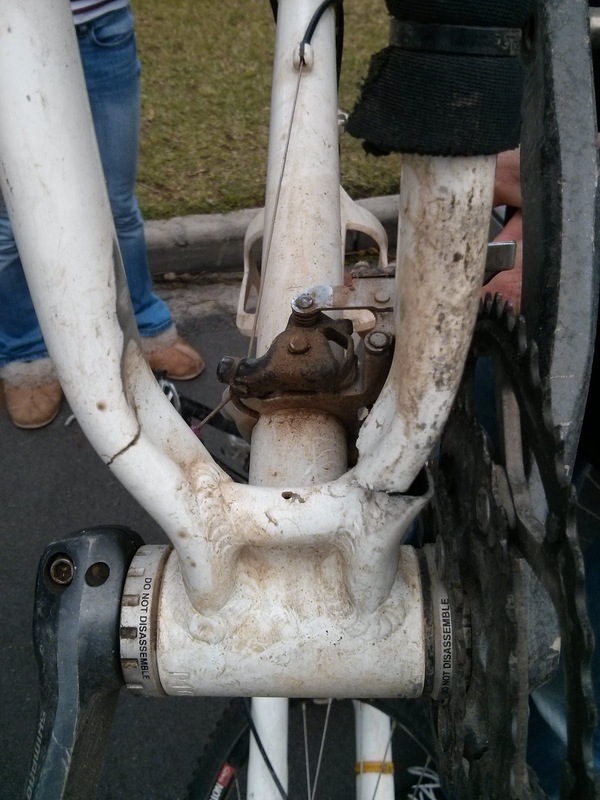 Our dreams of a podium were as broken as Captain Craig's bike. With that realisation, it was time to make a decision. Much like the Navy SEALs, and as much as we like to mess with each other, The Night Time Ninjas obey the unwritten code of "Leave no man behind". Despite his protestations for us to stay in the lead bunch, OMJ and myself dropped off the pace to nurse Captain Craig to the next checkpoint. Perhaps we could salvage our race once we got there. Maybe we could repair the break, or find a spare bicycle. 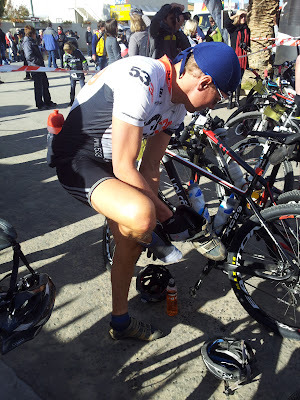 Upon reaching the checkpoint we quickly realised that his bike was beyond repair, and it probably wouldn't last another 5kms. Our only hope was to find a spare bike. While the checkpoint offered coke, marsh mellows and friendly conversation, spare bikes were in short supply. 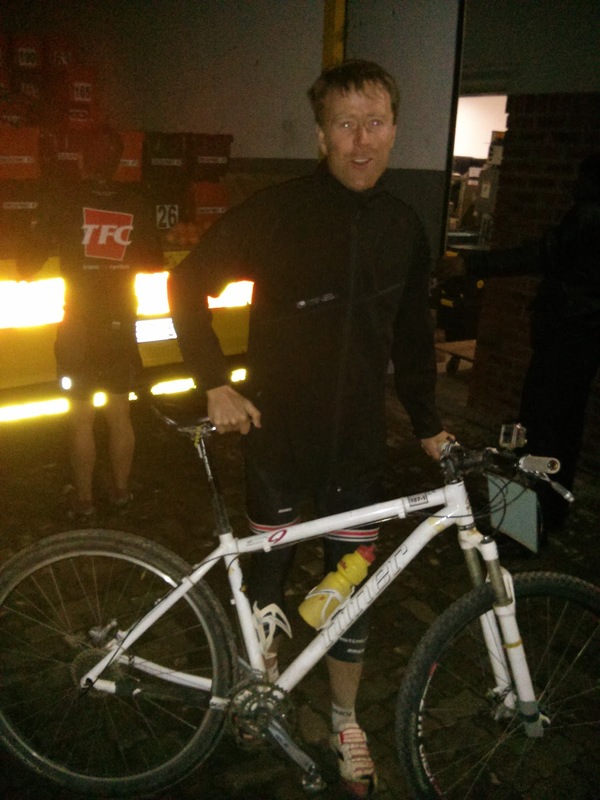 OMJ gallantly offered up his bike but Captain Craig refused. I'm not sure if it was because he'd accepted his fate, or because he didn't want to ride a Silverback, but after a prolonged goodbye, only two thirds of The Night Time Ninjas left the checkpoint, not knowing if we'd ever ride together again. 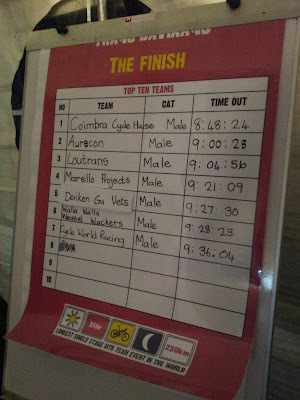 We were now officially unofficial finishers, our race was over, along with our aspirations of a good result. 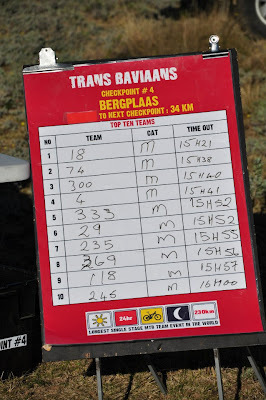 The only thing keeping us going was that this was my 10th Trans Baviaans, and that I had to finish before 10am on Sunday to remain in the small group of 3 riders who have finished all the Trans Baviaans events to date. We plodded along like a car running on 3 cylinders, tapping out a good tempo, but lacking the raciness that we usually exhibit. We were catching the back markers of the lead bunch, and while we weren't really racing them, it did feel good to move back up through the field. After leaving Checkpoint 2 in unofficial 18th place, we arrived at Checkpoint 4 in unofficial 10th place which only reinforced our feelings of what could have been. 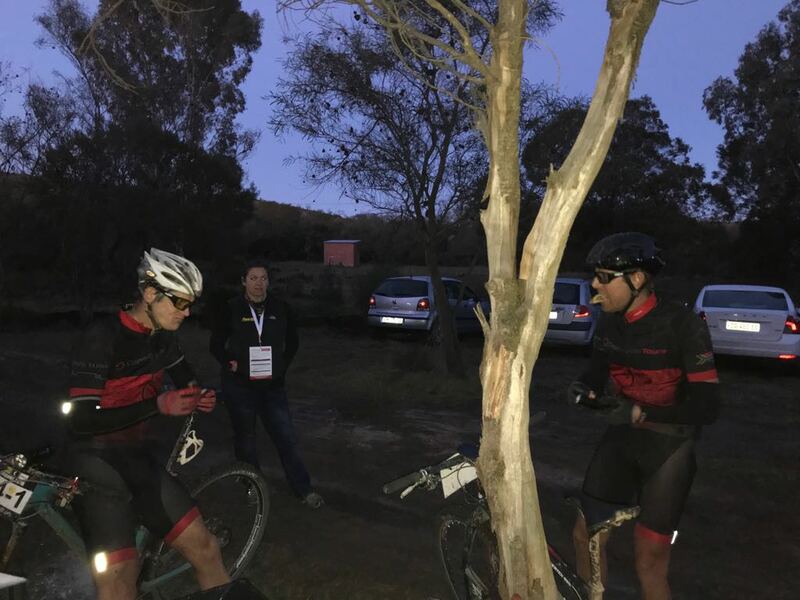 With OMJ doing his first Baviaans on a hardtail 29er, and Captain Craig making friends with the officials at Checkpoint 2, the responsibility fell to me to pick the lines down Combrink's Pass. Having spent 6 years following my teammates, the sudden responsibility lead to some rather interesting decisions, the more interesting of which would get a running commentary from OMJ behind. Somewhere down the pass I hit something and lost some air in my rear tyre. An on-the-go inspection seemed to indicate that the tyre was ok, and that it was holding air. It just wasn't holding as much air as I would have liked. With renewed determination to get to the checkpoint at Kondomo to sort out the wheel, the Surviving Night Time Ninjas put their heads down and rode like the wind. The 17 different weather websites that I'd frequented in the days leading up to Trans Baviaans had all promised a westerly to south westerly gale which would be a tail wind for most of the ride, so you can imagine our surprise when we found ourselves battling a nasty headwind for the 20kms leading into Kondomo. As I filled my tyre with air, OMJ filled his belly with whatever he could find - coffee, oranges, banana bread, and jelly babies, all washed down by several swigs of water. We said goodbye to our ever faithful backup and hit the road, having slipped from unofficial 10th to unofficial 13th place. The short stretch of tar was a welcome relief, and my roadie roots came to the fore, towing OMJ to the foot of the Never Ender - a long, gentle climb that acts like a slow poison, slowly wearing you down bit by bit, till you long to be put out of your misery. 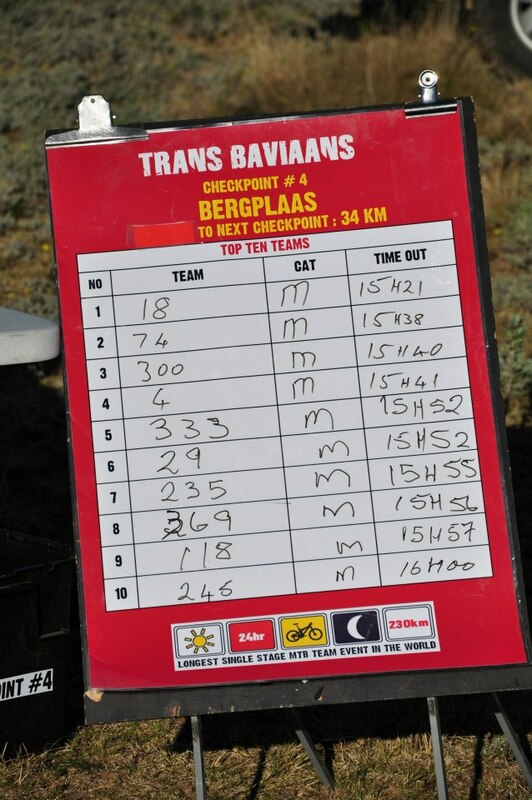 I am the holder of a rather dubious record at Trans Baviaans - I have ejected my stomach contents on 3 different climbs, in 3 successive years. This year I was hoping that I could finally break my run of gastric elimination. 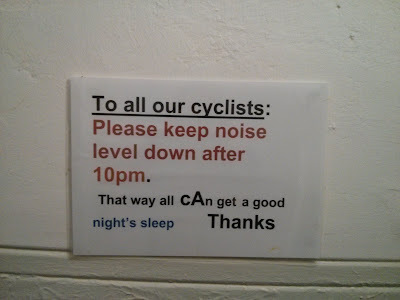 With two climbs to go, all signs were looking good, I'd been careful in what I'd eaten and my stomach felt settled. 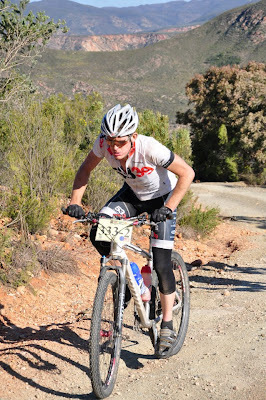 As we made our way up the Never Ender I was once again getting abuse from OMJ regarding my choice of line, the hardtail 29er doing his tender bum no favours. Trying my best to limit the grumpiness, I was picking smooth manicured lines up the climb when I heard a massive grumble from behind. Thinking I was in trouble again, I looked over my shoulder only to see OMJ saying goodbye to the remainder of his snacks from the previous checkpoint as they exited via his mouth. While I know how awful it feels to be in that situation, I couldn't have been happier that it wasn't me. I also have to blame OMJ for what happened next. Because of his dramatic emergency stomach purge, I was a little hesitant to fall victim to the same fate, and neglected to eat. As a result, I briefly had a bad patch where my legs deserted me and I was pedalling in squares. 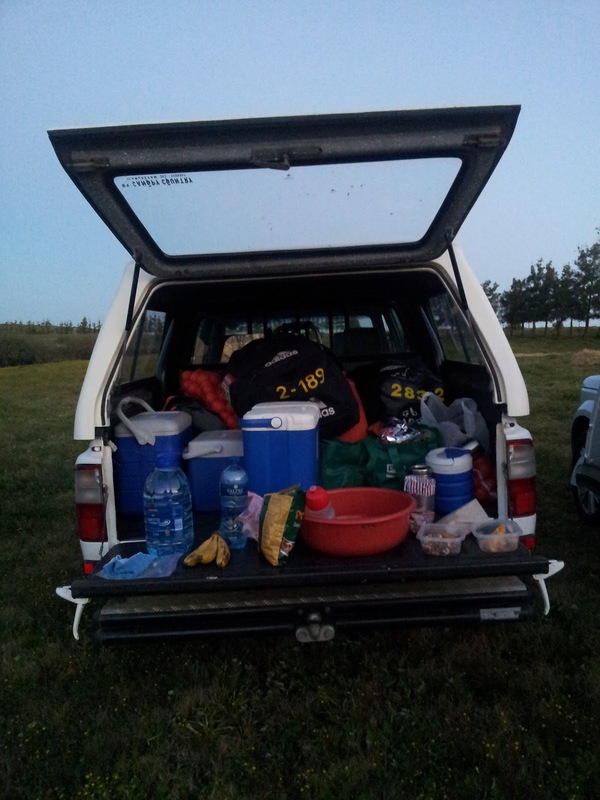 Thankfully, this was quickly remedied with some Dutch mini Stroopwafles - the legs came back with the top of the Never Ender in sight and the Depleted Night Time Ninjas were back on track to make the final checkpoint before sunset. As we rolled into Checkpoint 7, I briefly flirted with the idea of a quick stop and a dash to the finish in an attempt to crack the 9hr mark. 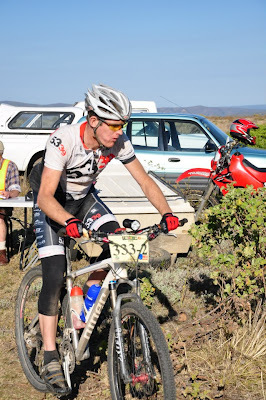 As unofficial finishers it really didn't make that much difference, and since OMJ had vowed retirement from competitive bike racing after this year's Baviaans, I thought he might want to enjoy the last 20 kms. 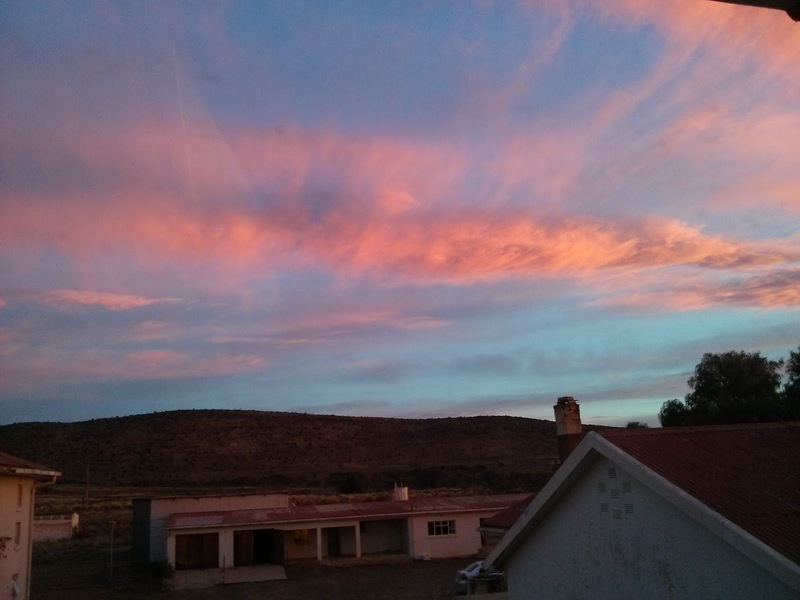 We finally turned our lights on, and headed off towards the lights of Jeffreys Bay. After a fast a furious chase, we hooked up with another team as we hit the tar for the long and arduous grind to the finish. I don't think there is a worse finish to a bike race in South Africa - an uphill tar drag into a raging crosswind for several kilometers. 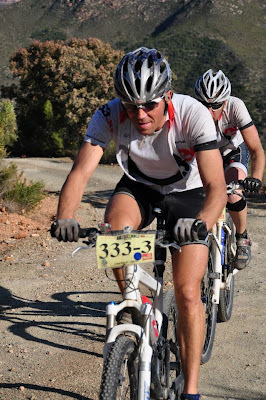 Add a teammate who can't ride in an echelon (like most mountain bikers) and it made for a long and frustrating finish after the beauty of the previous 220kms. The Vestigial Night Time Ninjas crossed the line in an unofficial 11th place, in 9h04, a bittersweet Pyrrhic victory. As we sat there, eating our Spur burgers, our thoughts turned to our missing teammate. No one had heard a thing from him, and we had no indication as to where he was. 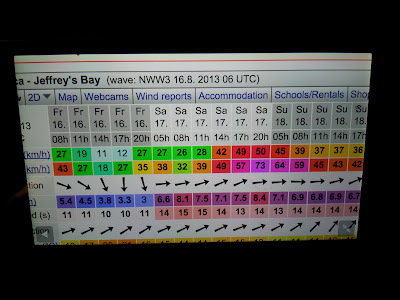 Our only hope was that he would use his wit and charm and hopefully by some miracle find his way to Jeffreys Bay. Just after midnight we got a call that he was at the finish. By now the temperature had plummeted, the wind was howling, it was pouring with rain - generally not a good idea to be outside. 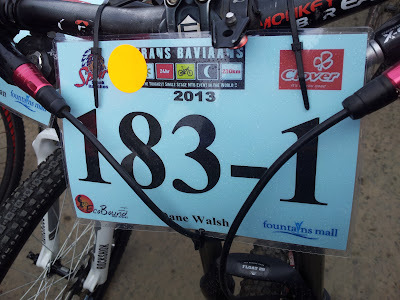 As we drove to pick up Captain Craig we passed countless teams, slogging it out in the foulest of weather up the ridiculous tar climb to the finish. 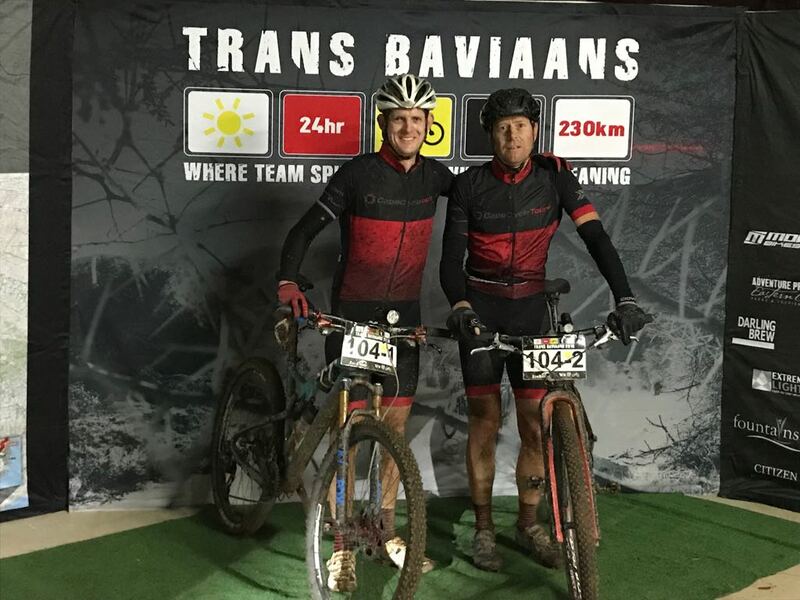 These are the real champions of Trans Baviaans, the unsung heroes. The guys and girls who spend many more hours in the saddle, fighting the terrain, their bikes, on the limit of their fitness. 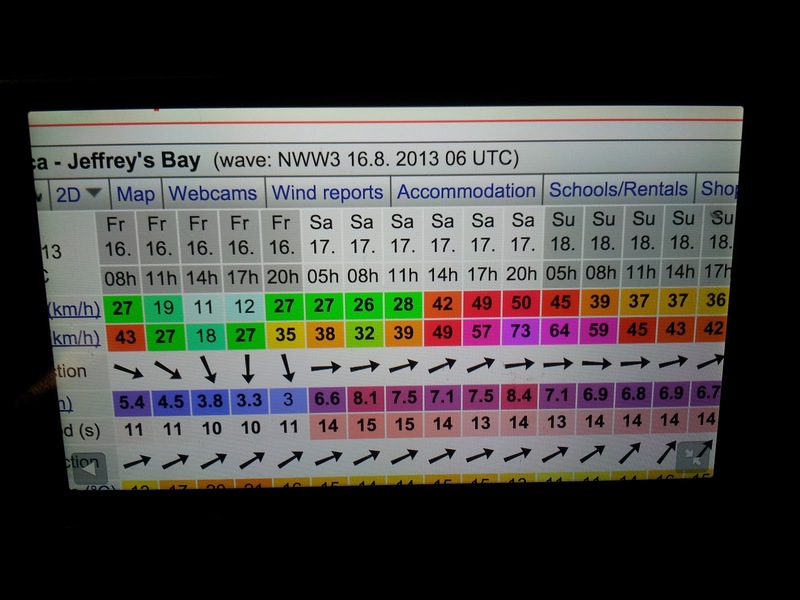 It's darker, colder, windier, yet they're out there. And they'll be out there again next year. Just like me. 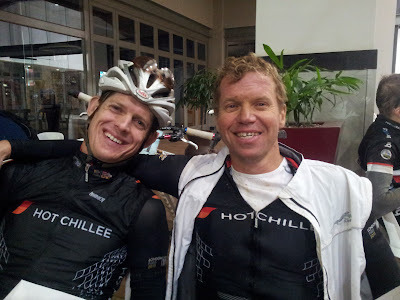 Once again, three middle aged men made the pilgrimage to Willowmore in the Eastern Cape for the small matter of a bike race. 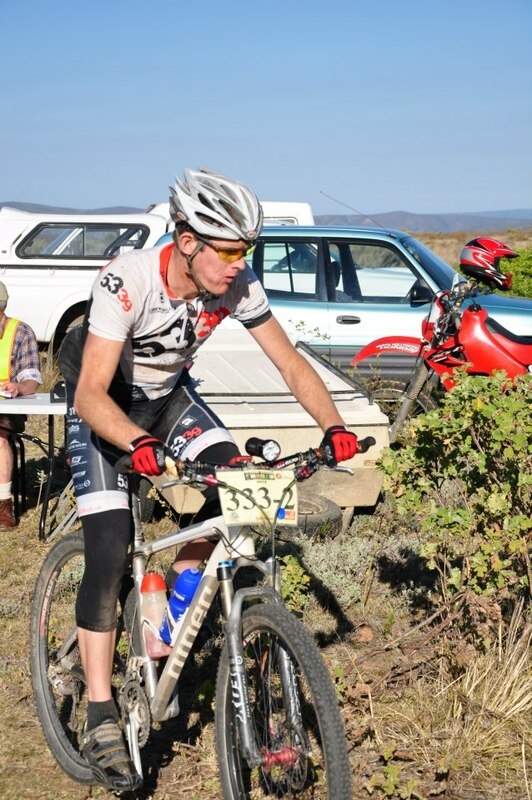 Not just any bike race - the 9th edition of the Trans Baviaans mountain bike race. The usual crew of Captain Craig, Little John and myself were all together for one last attempt at a top five finish - Little John is slowly starting his transformation from wannabee race snake to leisurely weekend warrior, shifting his focus from 5am tempo rides to 5pm sundowner rides, from riding flat out to riding flat roads, from clocking up 25 hours a week on the bike to clocking 25 hours a weekend with his family. In what has become another Baviaans tradition, we spent the night in the Willowmore School hostel, listening to the nervous restlessness of the first timers, hearing them clomp up and down to the toilets at all hours of the night, burying our heads under our pillows as they got ready for the 10am start at 5am in the morning. With our beauty sleep ruined we finally got up, put out our kit and supplies for the day and wandered off to breakfast. I've discovered a new party trick that works especially well in the crowded dining hall of the Willowmore School hostel - find a rather nervous looking individual and strike up a conversation about the race, without giving too much away. Offer some advice, tell them not to worry too much and let them know what a fantastic event it is. Eventually he'll ask how many times I've done the race or what my best time is and this is where I love watching people's facial expressions. They range from total disbelief to wild skepticism. In a way I'm a little hurt that no one takes us seriously, but generally when your team name is Walla Walla Weasel Whackers, I really shouldn't expect anything less. Out of respect for Little John's retirement race, I'd opted not to name our team the usual name of Soggy Bottom Boys. With 10am fast approaching, we packed our supply boxes for later in the day, put on our 5339.co.uk kit, stuffed our pockets with supplies and tools, and headed off to the start line. 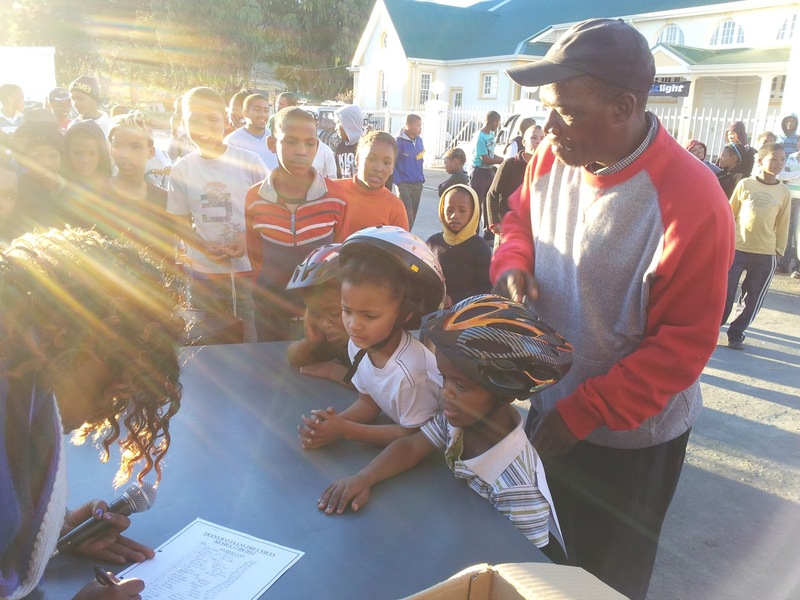 It's not often you get to see the impact an event has on the local community, but as Trans Baviaans has grown, so too has the involvement and interest from locals. In what used to be a one horse town where if you ventured too far away from the local hotel you might never see your teammates again, the whole community comes out to support the race, lining the recently swept streets and cheering wildly. In a week where many needlessly lost their lives in the Lonmin mine shootings, it was refreshing to see South Africans of all shapes, sizes and backgrounds coming together in the name of sport. After another mumbled race briefing by Wikus the organiser and a much improved rendition of the national anthem, we were set on our way for the 230km ride to Jeffrey's Bay. 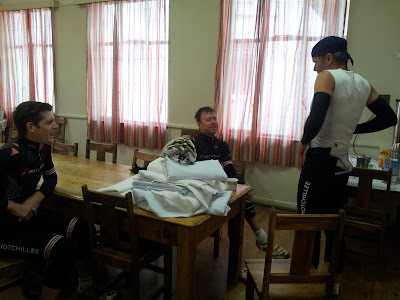 A lead bunch immediately formed and so began the cycling poker. For the next three hours there was bluffing, double bluffing, peeking at the cards of others and a bit of underhanded dirty tactics. All the cycling tricks in the book were used, from glass pedaling on the front to wheel sucking on the back, from upping the pace when "The Biggest Cyclist in the World"™ had a mechanical to surging on the hills - everything to get some sort of advantage over the rest of the bunch for the second part of the race. In the blink of an eye we had done 105kms in 3h20 to checkpoint 2 - Little John fighting with the big boys on the front of the bunch while Captain Craig and I dangled off the back as we took a bit of strain through the countless water crossing as the bunch surged to get back up to speed on the exits. 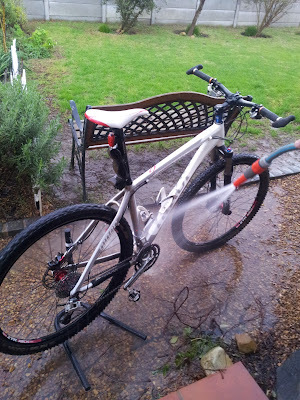 Any hopes about not getting wet feet or a soggy chamois were dashed on the first crossing. As the day wore on and the temperature started to rise, I think many riders in the bunch were only too glad for the regular cooling of feet, legs and bums. Little John was the only one doing the "YMCA"
The strategy from checkpoint 2 onward is simple - ride a constant, steady pace from checkpoint to checkpoint. Make the most of the good patches, and survive the bad patches. Little John, much like a fine wine or smelly cheese just seemed to get better with age and the responsibility of setting the pace fell to him. If there ever was a point to be made in the 26 vs 29 inch wheel size debate, Little John was coming out fighting for the little wheels as he made his teammates on the bigger wheels work rather hard to keep up. 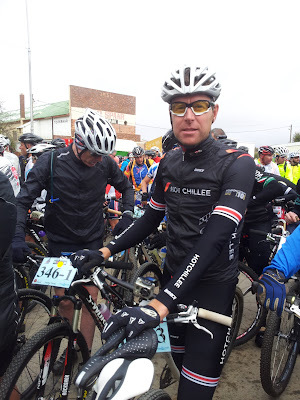 With his hairy legs and baggy shirt, his cycling bandanna and retro helmet, he certainly looks the part of a weekend warrior, not the race snakes which we found ourselves amongst. 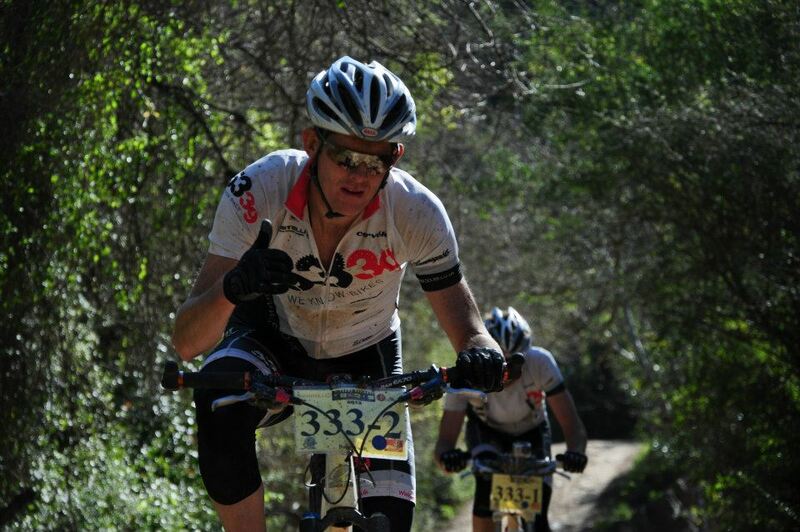 A solid ride to checkpoint 3 had us arriving in 10th place overall. A quick change of bottles and some salty potatoes later and we were on our way, heading towards my nemesis - The Mother of All Climbs. 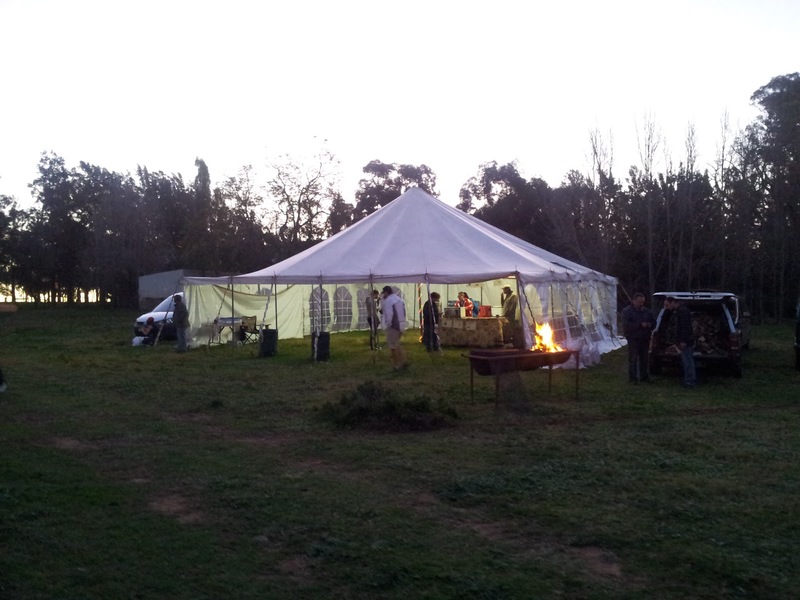 If something can go wrong for me at Baviaans, this is usually the place where it happens. I've had a massive side wall cut in my tyre, I've bonked so badly that Little John had to push my bike as I tried to stumble up the hill, I've developed stomach issues and had to take a moment to purge my stomach contents. 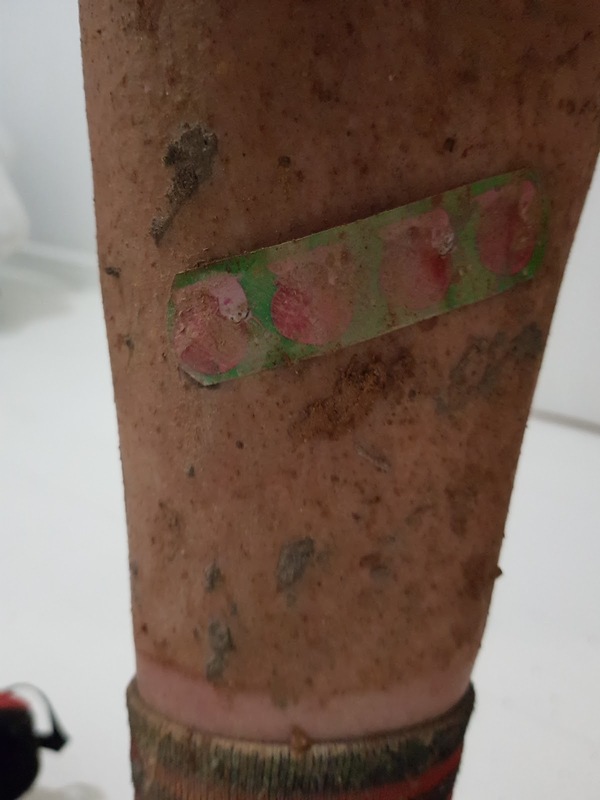 All I wanted was an incident free leg of 28km up to checkpoint 4 at Bergplaas. Shortly after leaving checkpoint 3 we found ourselves in 8th place as the two leading teams came past us in the wrong direction - they had missed the checkpoint. I felt for them, as Little John and I had pulled the same move in 2007. Not only do you end up riding an extra 10kms, but doubts and cracks begin to appear in your mind. It wasn't long after that move that I found myself walking up MAC. Little John set another superb pace as we approached the climb. Much like meeting your in-laws for the first time - it's not something you want to do, but it is inevitable - we started climbing. I kept waiting for the ninja of death to strike me down, but the further we made it up the climb without the ninja of death making an appearance, the more confident I became that I could finally banish my MAC demons. It certainly helped the spirits that we caught and passed 3 teams on the climb, and in a symbolic gesture of thanks for all the times Captain Craig has had to deal with my self destruction on this climb, I was even able to give him a slight push. As we approached checkpoint 4, Little John adopted his father voice and demeanor and barked out orders to his younger teammates about the schedule of happenings for checkpoint 4. I was tasked with getting life saving soup and bread rolls for the Weasel Whackers, while Little John would get our box. Captain Craig got a pass, and was told to do whatever it is he does. A cup of coke, some soothing bum cream and the life saving soup later we were ready to leave. With a pit stop more commonly found in a Formula One Grand Prix we'd been able to climb up the leader board, and we found ourselves in 5th place as we signed out of checkpoint 4. Out of habit from when we used to be slow, we'd attached our lights at the stop, but at the rate we'd been riding, we'd only need them several hours later. As we were leaving we caught sight of "The Biggest Cyclist in the World"™ and his team, and this provided us with some added motivation to make use of the fantastic descent down the other side of the MAC. It wasn't long before we found ourselves back on the valley floor with another team for company. Little John and I shared the pace making as we drove on towards checkpoint 5 at Hadleigh, determined to make the teams behind us work hard if they wanted to catch us. I also knew that we'd never hear the end of it if Little John did all the work on the front as we loafed at the back. Sometimes the bigger picture needs to considered, despite the consequences. We flew into checkpoint 5 where we finally met up with our support - my very capable and experienced wife. 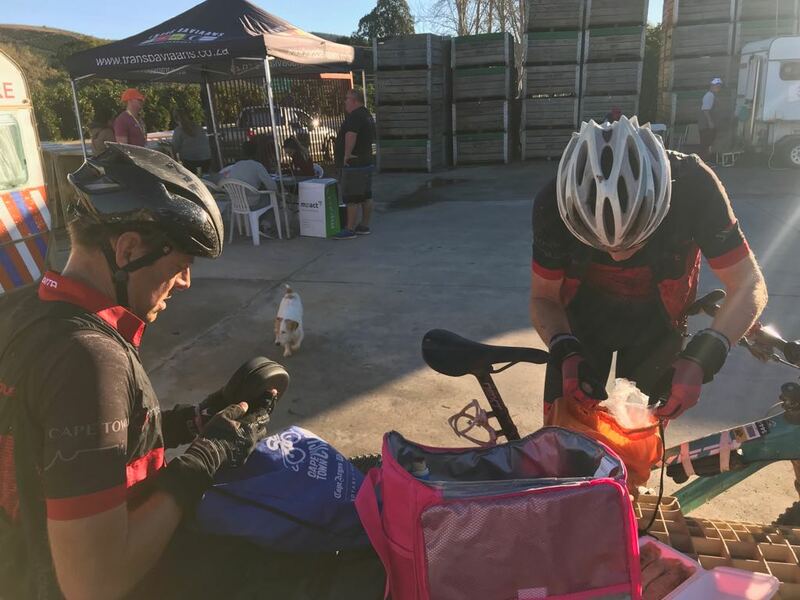 A quick bottle change, some fluid and snacks and we were back on the route in 5th place - Jeffrey's Bay was almost within sniffing distance. Just the small matter of the Never Ender climb stood between us and the downhill to the finish. 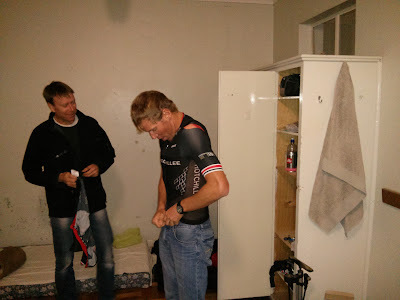 The roadie in me appreciated the tar section out of Hadleigh before we turned off onto the road to Humansdorp. 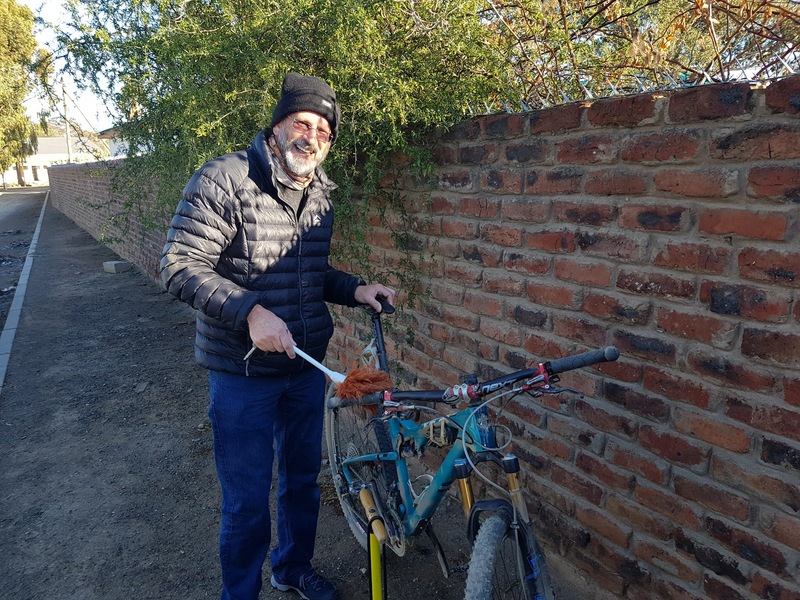 Captain Craig navigated the flooded Gamtoos River crossing on his bike while Little John and I chose discretion over valour and walked through the thigh deep, ice cold waters. And then the Never Ender began. 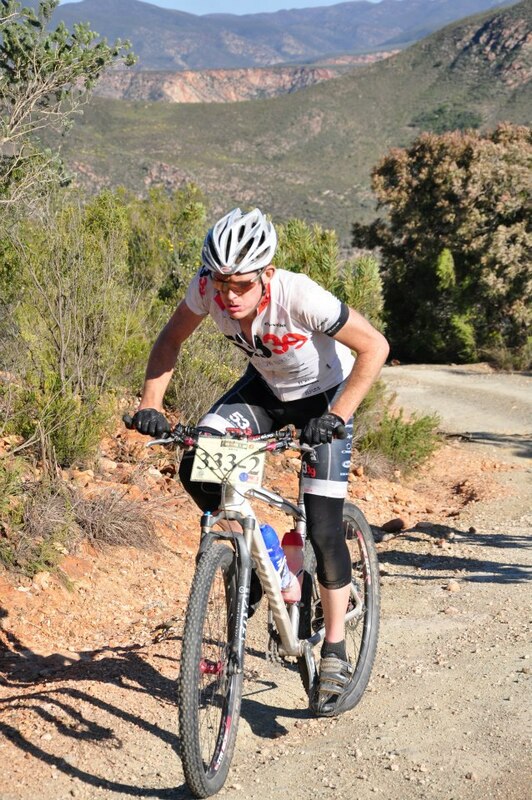 Little John immediately went to the front and set a perfect pace and the two 29ers slotted in behind. Thank goodness there were no photographers to record the rather embarrassing situation. We made good progress up the Never Ender when disaster struck. I had been taking a bit of strain with Little John's relentless tempo and in an effort to get a boost I took a Gu. Next thing I knew I was projectile vomiting like a newborn baby. There is nothing quite as funny as watching the awkwardness between two grown men deciding how to react to a teammate who is ejecting a troublesome Gu as fast and as violently as possible. 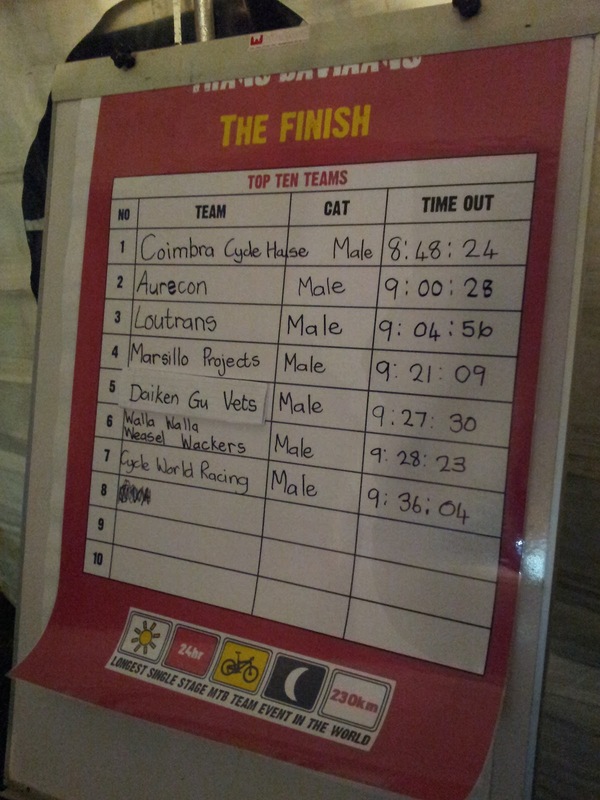 To my credit, I was able to do all this on the bike, with only a marginal decrease in pace. I was however quite disappointed that I'd been unable to break my run of reverse gastric emptying. Once the awkwardness had subsided a little, and my teammates had realised that I was going to live, Little John resumed the pace setting as we neared the top of the climb with the sun slowly sinking below the horizon. After lugging the lights around for several hours, we were finally able to use them. Still in parent mode, Little John told Captain Craig to turn his light on, despite it not being quite dark enough. He would later tell us that Captain Craig has a reputation for falling over in broad daylight, and he wasn't going to take any chances with him in the semi-darkness. As we approached the unmanned checkpoint we saw the tell tale sign of some lights stalking us from behind. Try as we might we could not hold them off, and as we arrived at checkpoint 6 we found ourselves in 6th place with 30kms to go. A quick stop, some ego pandering from my wife, some last minute snacks and we were off - the Jeffrey's Bay lights beckoning in the distance. Captain Craig was finally taking strain - he'd been threatening us with stories of poor form all ride long and after 8 hours of showing little weakness we didn't actually believe him. 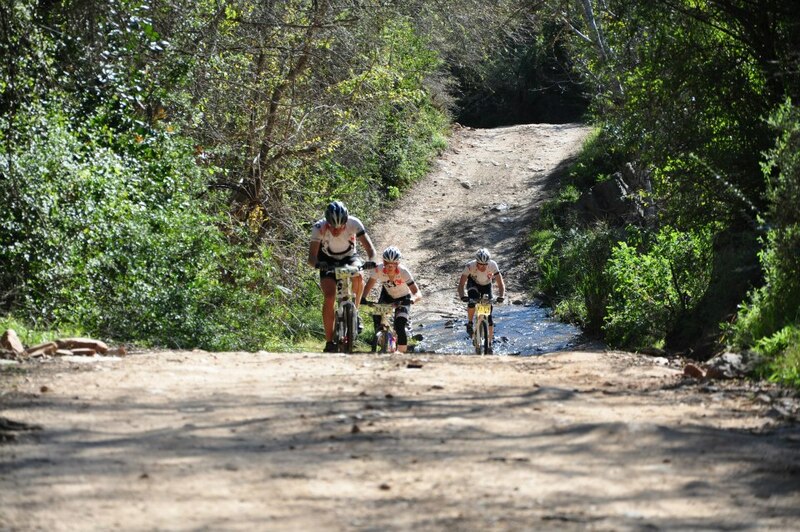 One last river crossing followed by a leg busting climb, and it would be a cruise into the finish. Or so I thought. Captain Craig caught sight of a pair of fast approaching lights, and in the most rapid onset of white line fever I have ever seen, went to the front for the first time all day and proceeded to rip my legs off. As he powered his way towards Jeffrey's, the regrets started. 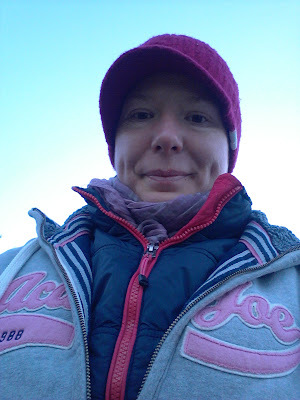 I regretted the push I had given him near the top of MAC, I regretted all the times I had gone to the front to help Little John, I regretted the speed sessions I had missed because of the rain, I regretted not choosing running as my sport of choice. The Walla Walla Weasel Whackers - 6th place overall and first 3 man team. We never did see those lights behind us again. As if it wasn't bad enough, Captain Craig caught sight of the team ahead of us, and although I didn't think it was possible, managed to up the pace even more. I don't recall too much of the final 10kms, except for Little John's rear tyre, and the pain in my jaw from biting down on my handle bars. I didn't know if we were catching the team ahead, and I didn't really care right then. I just wanted the pain to stop. 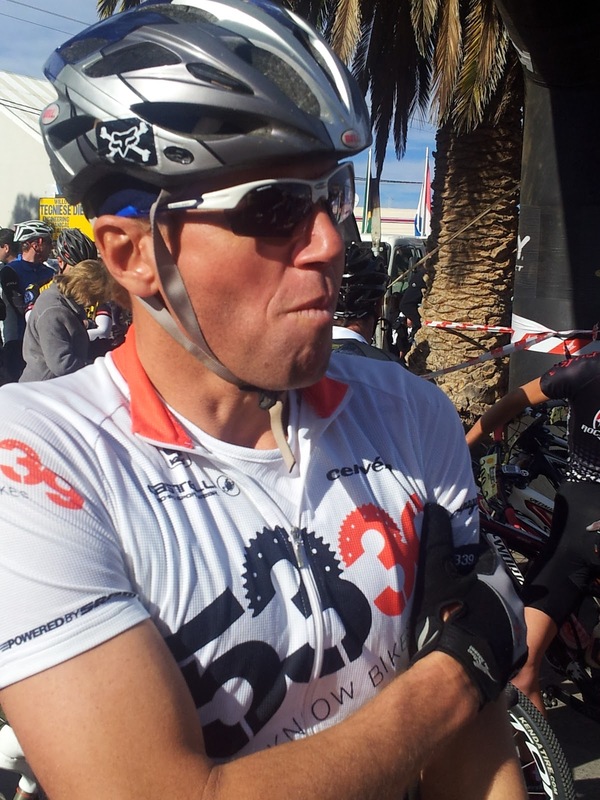 Thankfully, the finish line put an end to the pain and suffering - we'd crossed the line in 6th place in 9h28 - less than a minute down on the guys in 5th. An added bonus was that we were the first 3 man team. And with that I shook Little John's hand for the 6th and final time (I also had to endure a man hug). 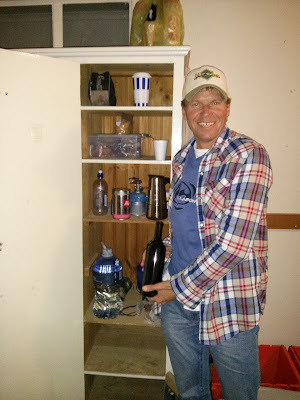 Captain Craig had finished his 5th Baviaans, and I was on my 9th. As they say though - the band has to break up before they can have a reunion tour. Perhaps the Walla Walla Weasel Whackers will be back again next year with the original line up of Little John, Captain Craig and myself, or perhaps we'll hire a session cyclist to fill the void for a couple of years. For the ninth time in succession I made the pilgrimage to the dusty little one-horse town of Willowmore in the Karoo for the queen of endurance events - The Trans Baviaans. Once again, I had dragged my faithful sidekicks - Captain Craig and Little John along for the adventure, with Little John starting his 5th escapade from Willowmore to Jeffery's Bay. 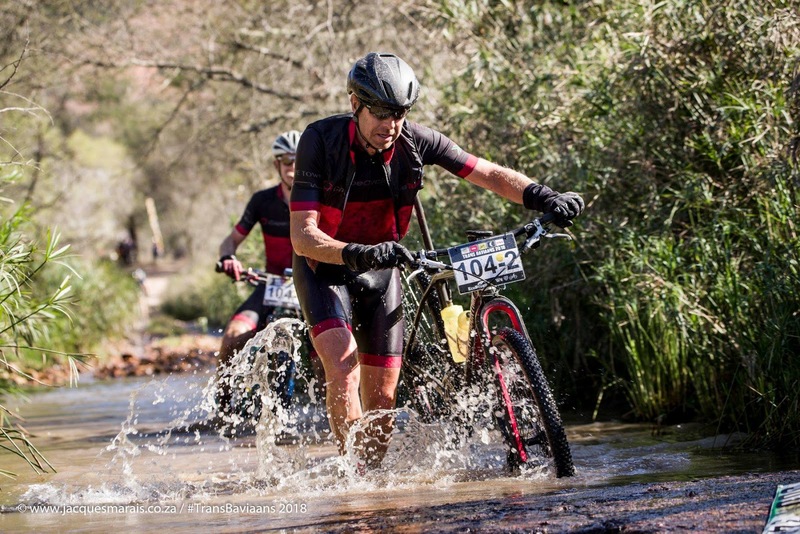 After 5 years of perfect conditions through the Baviaans Kloof, Mother Nature decided to show her angry side and had unleashed a spate of bad weather over the Eastern Cape, with the result being that the rivers in the Baviaans Kloof were barely passable on a bicycle, and completely impassable in a vehicle. 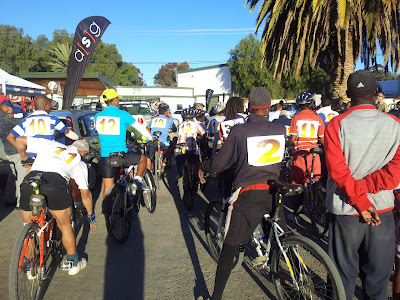 Rather than pull a Pied Piper of Hamlin move and lead 1200 cyclists to a cold and watery death, the organisers put Plan B into action - code named "LangsBaviaans" (for the 2 english readers out there - "Next To Baviaans"). While we wouldn't be going into the Baviaans Kloof, we would riding one mountain range over to the right. The positive being that my nemesis hill - The Mother of All Climbs - was no longer part of the route. However, a new hill affectionately dubbed The Father of All Climbs had been found to spice things up (and give me sleepless nights). 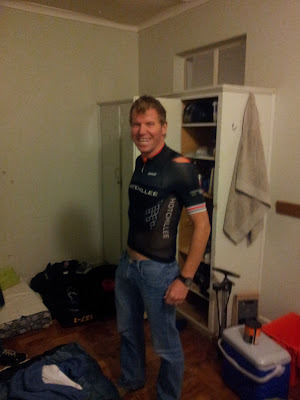 Captain Craig, wearing all his branded race gear. After spending a noisy night in Willowmore Primary School's hostel, and being woken up at 4:30am by some very eager cyclists (bear in mind the race only starts at 10am) The Fire Breathing Rubber Duckies (formerly known as the Soggy Bottom Boys) were ready for the 235km trip that lay ahead. There was a fresh, chilly wind blowing, but thankfully the threatening rain clouds had disappeared overnight. Little John was given the honour of being the team captain to commemorate his fifth Baviaans adventure (and hopefully avoid any of the grumpiness from 2010). This wasn't just a token gesture - along with the title came some tasks and responsibility. Little John looking nervous, flanked by his merry men. An elementary seeding system was introduced this year, and our 7th place from 2010 ensured that we cracked the nod to start at the front of the race for a change. 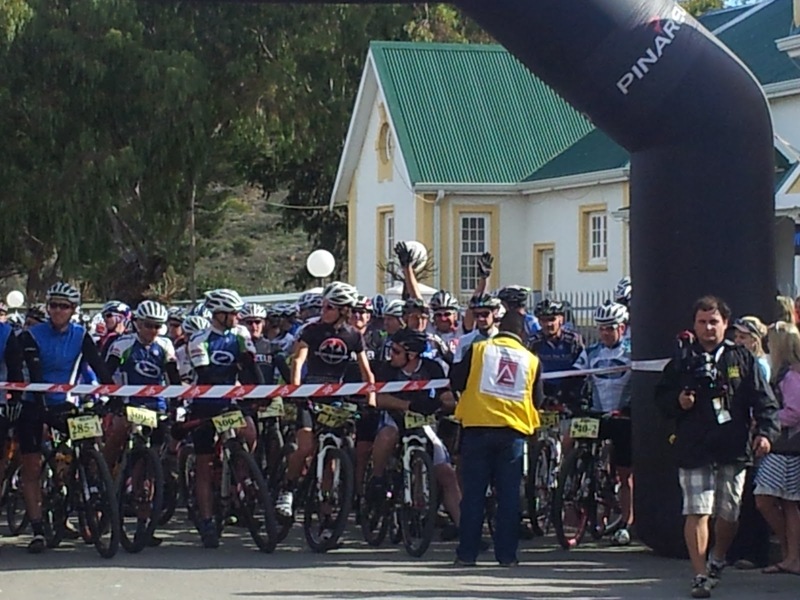 It also gave us an opportunity to suss out the top guys, psych out some buddies, and steal some camera time. Our 5339.co.uk kit got a couple of "Go home roadie" chirps. Little did they know that in true roadie fashion we also had newspapers stuffed under our jerseys to keep the cold tail wind out. After an interesting interpretation of our national anthem - Nkosi Sikelel' iAfrika - the race got under way, and almost immediately the biggest guy on a bicycle I have ever seen - he made his 29er look like a BMX - and his partner shot off the front of the lead bunch. There wasn't a reaction at all from the bunch, and if anything it had the opposite effect - the bunch sat up - everyone trying to hide from the wind and not do any work up front. Enter the Fire Breathing Rubber Duckies. Nkosi Sikelel' iAfrika performed by the Willowmore Wailers. With a massive bunch of wheel sucking mountain bikers on our wheels Captain Craig and I took turns on the front, enjoying the open road, the tail wind and the beautiful Karoo scenery. After an hour and a bit a couple other teams came forward and helped out with the pace setting, and some moves started to go off the front. This was what we had been waiting for - time to thin out the bunch and get rid of the hangers-oners. Careful not to get into trouble with Little John we followed a good move that looked set on going away when Little John broke his chain. Just as in 2009, it felt like the entire field came past us as we tried to figure out how to fix it. In reality, we were probably only at the side of the road for about 5 minutes, but by the time we were rolling again the bunch was long gone. Now Captain Craig and I had no choice but to set the tempo and make sure Little John was protected on his Little Bike. We raced through checkpoint 1 after catching our first target, and up ahead we could see several other teams - encouragingly acting as carrots. With the skill of true roadies we'd figured out a move on overtaking the slower teams that would prevent them from hooking onto to our wheels. Little John was the key, and would fly past as we crested a hill or bump, and then Captain Craig or I hop across at pace. We're both convinced that Little John would make an excellent roadie - we're just not sure what will be easier - getting him on a road bike, or getting him to shave his legs. The roadies on the front! By the time we reached the second checkpoint we were lying in about 15th place, having made up a good few positions. We needed a quick stop to maintain our advantage and close in on the teams ahead of us when Little John failed in one of his captainly duties - he'd lost the little token that was marked at each checkpoint. This was a 20 minute penalty, the last thing The Fire Breathing Rubber Duckies needed. Thankfully Captain Craig kept a cool head and found the token, lying on the ground and averted a potential morale sapping disaster. Slowly but surely we were closing in other teams, and at the same time closing in on The Father of All Climbs. Almost on cue, my stomach started acting up, and only through the expert encouragement and motivation from Little John (never before has a coke been so intimately described) and some welcome pushing from Captain Craig did I reach checkpoint 3 in one piece. Another motivating factor not to get off and walk was the fact that I couldn't really walk. In an amateur move akin to wearing underpants under your cycling shorts to your first Argus (come on - you've all done it!) 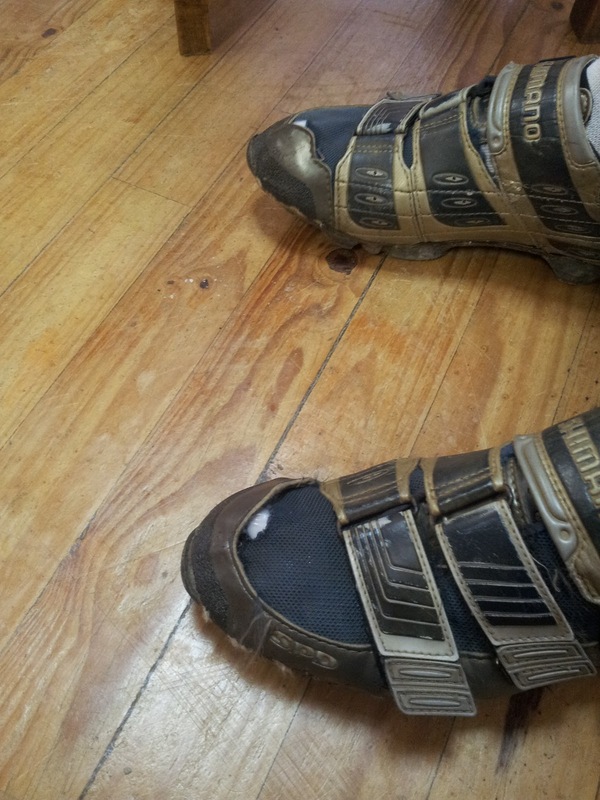 I had bought new cycling shoes the week before. While they did their job perfectly when riding, they chaffed like crazy when walking, and by the time I got to The Father of All Climbs I could already feel some blisters from the walk around the parking lot back in Willowmore. I didn't realise we were towing THAT many people! A quick purge of my stomach contents, 500ml of coke, some soup and a bun later and we were ready to conquer the rest of The Father of All Climbs. By now we had caught "The Biggest Cyclist in the World"™ and it was rather encouraging to see him walking up all the climbs. My legs felt great, my stomach was under control and the top of the climb was beckoning. A rather disappointing descent later and we arrived at checkpoint 4 in 12th place. A lightning quick stop including some expertly peeled Patensie oranges and some coffee for Little John and we were on our way again - the Never Ender ahead of us. 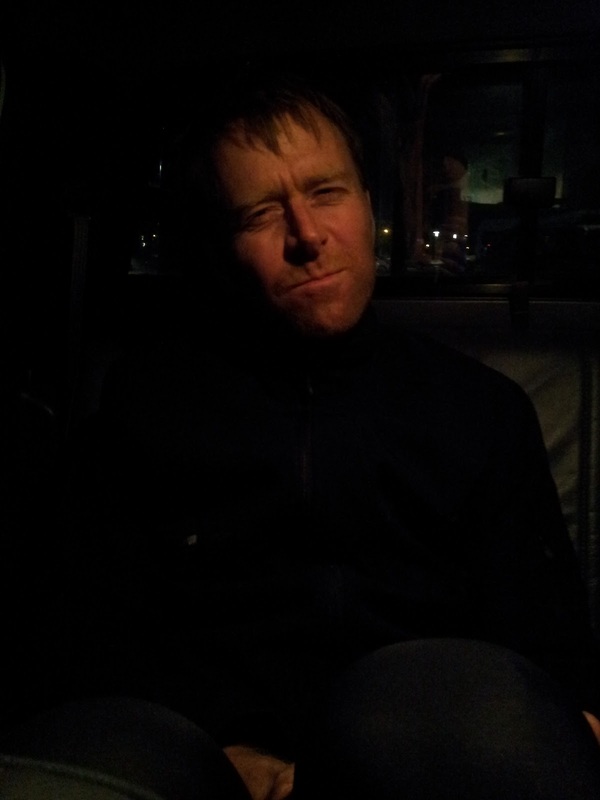 We briefly lost Captain Craig as he got lost IN the checkpoint, but a few minutes later we were on our way again. I was paying the price for trying to race "The Biggest Cyclist in the World"™ into checkpoint 4 and was having a (another) bad batch - thankfully not stomach related. Calling in some favours from several years ago, Captain Craig graciously offered a pocket for me to hang on to while the Gu kicked in. As the sun slowly set we could make out the lights of several teams ahead of us and we dropped a few gears, put our heads down, and rode like the wind catching and passing 4 teams along the way. Our professional backup driver (and my wife) later told us that we put in the 3rd fastest time on this leg, only 2 minutes slower than the eventual leaders. Another lightning quick transition, some raised voices in the direction of the backup driver (nothing that flowers couldn't fix later) and we were on our way, eager to make up some more ground when disaster struck. Little John collapsed in a heap right in front of me, with our two bikes getting tangled up together. On closer inspection the little wheels from Little John's bike had disappeared down a hole and he'd come to an abrupt stop. Fearing a buckled wheel, broken fork or some other race ending damage, we slowly extricated Little John from the hole and from his bike. Apart from the handle bars being slightly skew, everything was fine with his bike. It was only then that someone asked if he was ok, and thankfully a little thing like a hole wasn't going to stop Little John from getting to Jeffery's for the 5th time. We'd lost sight of the team in front of us, but there was no sign of anyone behind us either, so we rode a steady tempo into Jeffery's Bay, finishing the 2011 LangsBaviaans in 8th place as fireworks lit up the sky, in a time of 9h47. Little John had joined the Five Finisher's Club, and we all agreed - this was our best ride at Baviaans, even if it wasn't our best time or placing. They need a bigger board for our team name! Fire Breathing Rubber Duckies done. 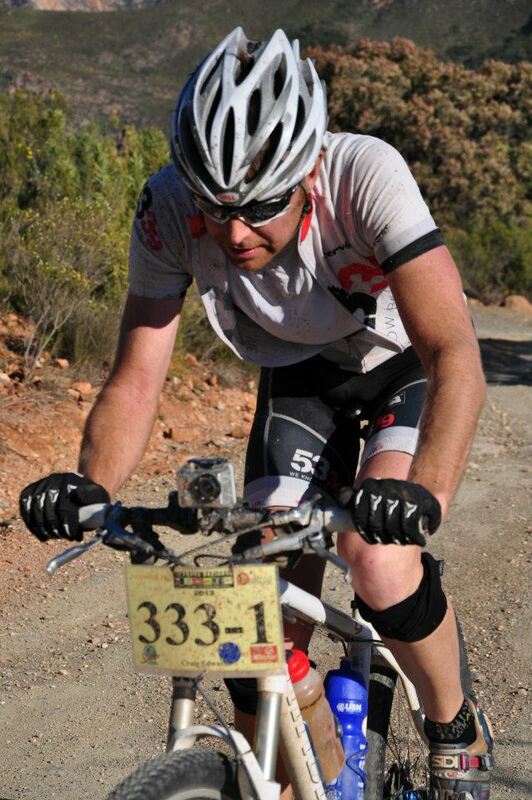 Little John has officially retired from the Trans Baviaans, but just like Lance we reckon he'll be back. As they say - you have to retire in order to make a comeback. (Some reading for you Little John). After all - it will be Captain Craig's fifth, and my tenth. Imagine the party afterwards!